Welcome friends! Today’s guest post was contributed by Shametria L. Routt, The Routty Math Teacher, and it is about implementing effective math talk in the classroom. This post includes tips and strategies to get you started, as well as a variety of resources to use on your journey. Happy reading! Using mathematical discussions in the classroom is a powerful way to increase our students’ critical thinking and communication skills. However, what does effective math talk in the classroom look and sound like? This article explores ways to get your students thinking and communicating mathematically from the very first days of school. The National Council of Teachers of Mathematics (NCTM) defines math talk as “the ways of representing, thinking, talking, and agreeing and disagreeing that teachers and students use to engage in [mathematical] tasks” (NCTM, 1991). Effective communication about mathematics is essential to help students develop the thinking, self-questioning, and explanation skills needed to master required skills and concepts. A successful mathematics program emphasizes communicating mathematically frequently in the classroom. In addition to NCTM’s standards, most state standards include competencies related to communicating effectively through mathematical language, justifying solutions, and evaluating the mathematical thinking of others. The picture below illustrates the interaction between the teacher and the students during effective math talk and demonstrates how knowledge is constructed through these interactions and exchanged with others. For a free download of my Looks Like/Sounds Like Poster, click here. 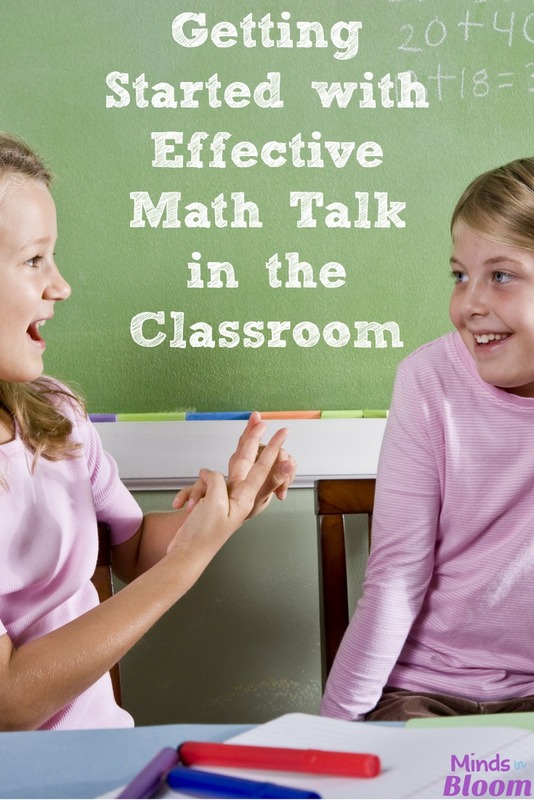 As with any lesson, it is essential to create a plan for using math talk in the classroom. During open strategy sharing, students discuss how they solved a particular problem. The students listen and share their ideas. The teacher probes the students with questions related to how they determined the solution and why they chose a particular solution path. 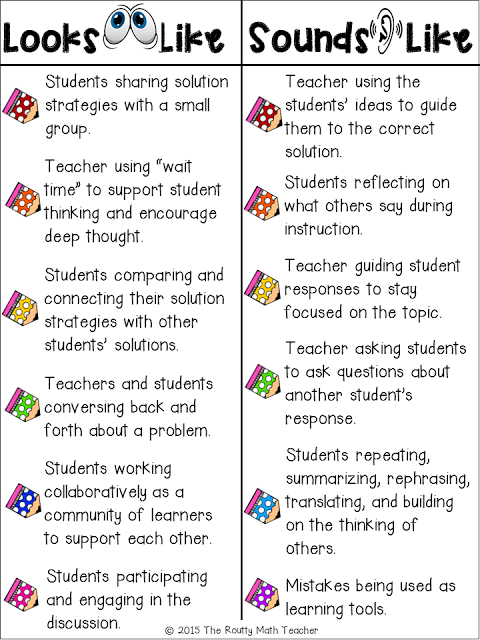 In addition, the teacher highlights a variety of strategies and emphasizes the similarities and differences among them. Define your goal: What do you hope to accomplish? 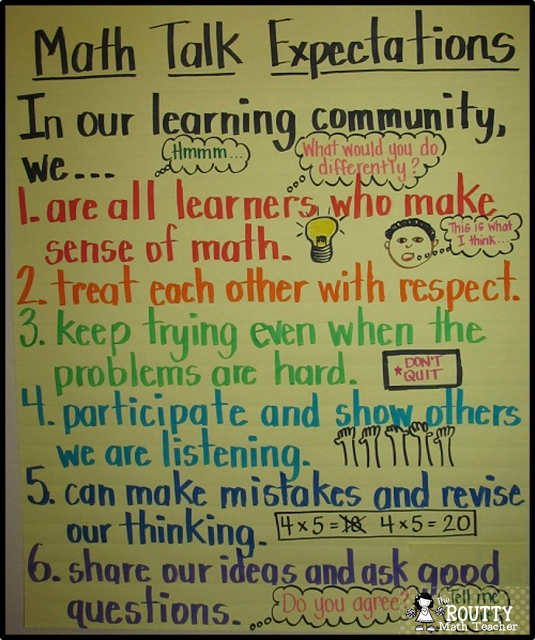 Goals for math talk include wanting students to: listen and compare methods used to solve a problem, look for the most efficient way to solve a problem, generate explanations for why a particular solution works, or examine why one solution is correct and why another is not. Choose a Problem: This depends on your goal. If you want to highlight a variety of strategies that can be used to solve a problem, then choose a problem with multiple solution strategies. If you are examining why one solution is correct over another, then choose a problem where students frequently make missteps in their solution strategy. 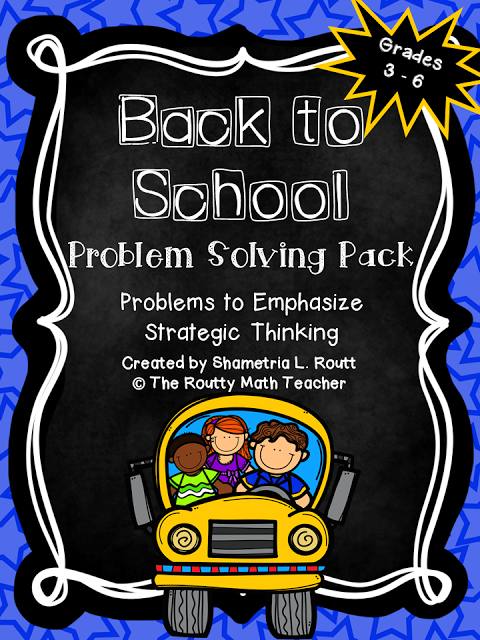 Use my Back to School Math Problem Solving Pack to get you started! You can find it in my TpT store. Monitor Student Responses: During this time observe the interactions of the groups and make notes about their solution strategies. Also, note any observed areas of concern to address at a later time. Select Students to Present: Based on your observations, determine which solution strategies to highlight that will best help you accomplish your goal. For example, if you want to emphasize a variety of strategies to solve a particular problem, select solutions that vary from one another. Sequence Student Responses: Order the presentation of the solution strategies in a manner that will allow you to maximize the students’ learning experience. For example, beginning with the most widely used strategy and then moving to the more abstract strategies may draw students’ attention to new methods. Similarly, beginning with the more concrete strategies will give students the opportunity to move from a more concrete to an abstract understanding. Connect Student Responses: The most important aspect of using math talk in the classroom is the connections between solutions that you and the students make. In the beginning students will need your support to make these connections. For example, if you sequence the presentations from less sophisticated to more sophisticated, you can have students discuss the similarities and differences between the solutions. You can also discuss efficiency. Which process is more efficient? The “Open-Ended Questions” chart above has a great list of questions both you and the students can use during math talk to make connections and analyze solution strategies. 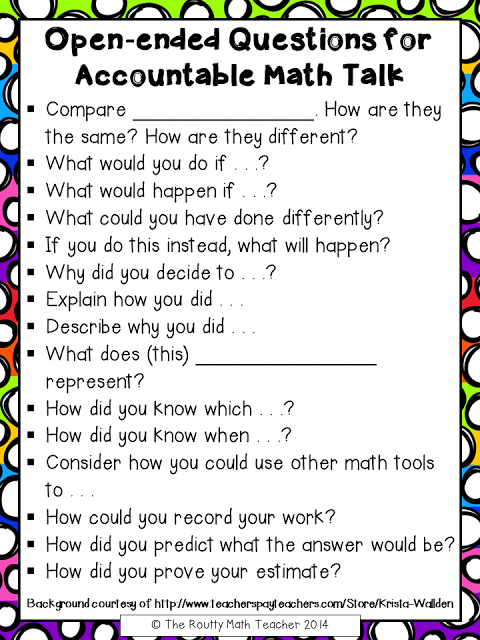 Find the download for my Open-Ended Questions for Accountable Math Talk in my TpT store. 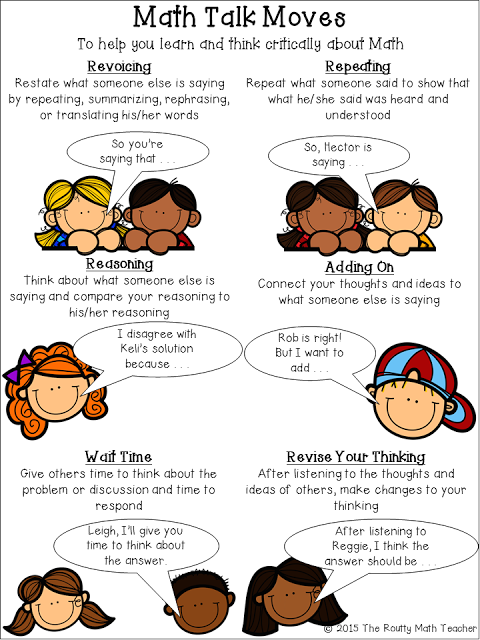 Use the “Math Talk Moves” poster above to teach students how to make connections and respond to others during math talk. The poster describes moves made by the student. The teacher should teach these moves and encourage their use during discussion. You may even want to have a “Move of the Day/Week” to highlight ways to connect student ideas. Additionally, you may want to include these in the students’ math notebooks or tape a copy to their desks to refer to during the discussion. Please note: Several resources describe “Turn and Talk” as a math talk move. Because I chose to focus my poster on student moves, I did not include it; however, it is a useful move to use during math talk so that students have another participant to share ideas with during large class discussions. From that point, they can choose a student move to keep the conversation going or choose one move for a class-wide share-out. To get your own copy of my Math Talk Moves poster, please visit my TpT store. Participation is key! Sometimes it’s hard to get all students to participate because they’re afraid to take risks. 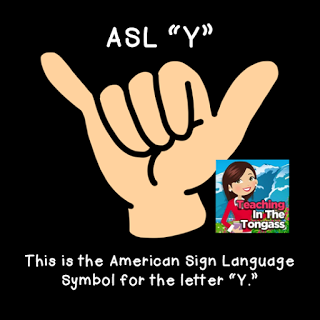 One of the ways you can get your more reluctant students to take part in the conversation is through the use of hand signals, such as teaching students to use the American Sign Language symbol for Y (see picture below) to indicate that they agree with someone else’s thinking. Once reluctant students see that they’re not alone, they may be willing to participate more. After reviewing the students’ solutions and listening to their presentations, use the information that you gathered to determine the next steps. The following activities will help extend and deepen the students’ understanding of the intended content and skills. Look for Areas of Concern: Reviewing the solutions for common errors or misconceptions may provide material for a mini-lesson or content for an additional problem solving task at a later date. Check for Reasonableness: It is essential that students develop the ability to verify their solutions and check them for reasonableness. After the discussion you can ask each group to develop a method to check their strategy for reasonableness or choose a specific solution and ask students to determine a method to check for reasonableness. Be sure to have students share and compare their strategies. Justify the Solution: In addition to being able to make sense of a solution, students should be able to explain why a specific solution strategy leads to the correct answer. For this activity have students use pictures, numbers, and words to make sense of the solution and explain why it works. Look for What Went Wrong: One of the most powerful activities for students is to examine their mistakes. Use one of the solution strategies that did not lead to the correct answer (if available) and explore where the solution went wrong. After determining the misstep, allow students an opportunity to complete the remainder of the solution strategy. If you don’t have an incorrect solution strategy to use, create one yourself and say, “What if someone had done (show the strategy)?” Then, allow the students to discuss the error(s). Implementing and planning regular math talk sessions will support the development of strong communication skills and deepen the students’ ability to reason and think critically about the intended math content and skills. Pinterest Board: There are many great resources for all grade levels on Pinterest. Click here to check out my Math Talk Pinterest board. 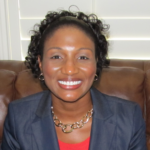 Shametria is a newlywed and has been a Texas educator for 13 years. She’s currently a Teacher Mentor for first- and second-year teachers and is working toward a Doctoral degree in Mathematics Education. She is also a blogger (emerging, anyway) and teacher-author for all things math! Check out her Routty Math Teacher blog and Teachers Pay Teachers store for some additional teaching tidbits and freebies! Kazemi, E. & Hintz, A. (2014). Intentional talk: How to structure and lead productive mathematical discussions. Stenhouse Publishers: Portland, Maine. Smith, M. S. & Stein, M. K. (2011). Five practices for orchestrating productive mathematics discussions. Corwin: Reston, Virginia. Just a quick request–can you make the Clipart secure in some way so it can't be lifted from the page? Thank you in advance! I just have a question. Do you have same strategies in Spanish for my first graders in Spanish Immersion? The author of this guest post says that the strategies are not available in a language other than English at this time. this was a great tool to use with my fifth graders! we just began nonfiction and can apply many aspects of this resource to same. I’m so glad you found the post helpful! I’ve never thought much about it, but you’re right– it’s a super versatile process that can be applied across the content areas. Thank you for sharing!